A few months ago, when I still had the time and energy to volunteer for the Austin Pets Alive! Bottle Baby Nursery, I got to name a litter of tiny kittens that just arrived from the city shelter. The names all had to start with the letter R, because of the way we track kittens in the program. There was a fat little boy kitten with no tail who I dubbed Rounder, a gorgeous girl kitten with a nub of a bunny tail who looked like a Rowena to me, and finally a torbie boy kitten with a long tail, huge ears and a certain noble spirit who struck me as Raleigh. I fed the babies and filled out their charts. Whenever I returned to the nursery over the next week, I checked on "my" R kittens first thing. 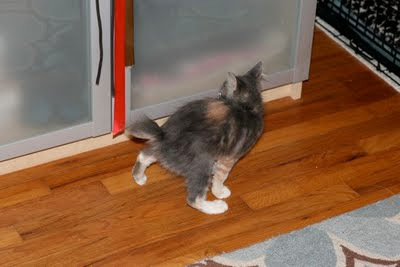 The next week, the kittens went into a great foster home. Though I knew they were in good hands, I missed Rounder, Rowena & Raleigh. I got to see them when they were seven weeks old, because their foster mom scheduled a meeting with a potential adopter at Tarrytown Austin Pets Alive! A month passed, and all three were still up for adoption. How people could turn down these gorgeous, exotic-looking kittens, I have no clue! 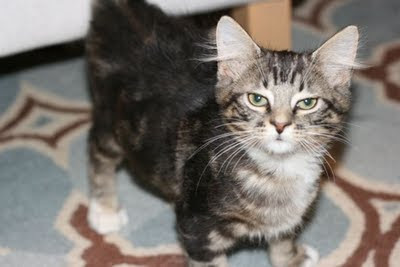 Finally, sweet Rounder got adopted and went to his forever home last week. Raleigh and Rowena went on the waiting list to enter the Tarrytown cat adoption center, but their foster mom needs to start traveling for work soon. 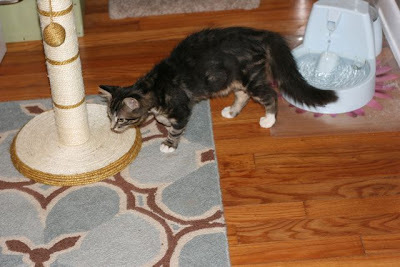 Rowena and Raleigh, now twelve weeks old, needed a temporary foster home. (I promise I asked Chad before I consented.) Two of "my" R kittens now live in the dressing room of the 1952 House! Temporarily, of course. They are so stinking cute! Busy Rowena half-hops / half-runs. Must be that bunny tail! Rowena says play, play, play! Our Persian and our Pittie-Lab-mix: both princesses! 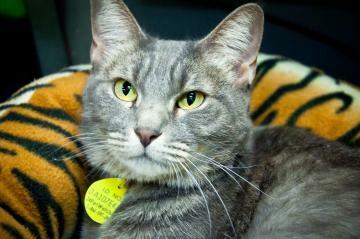 I want to adopt Lady Gray. 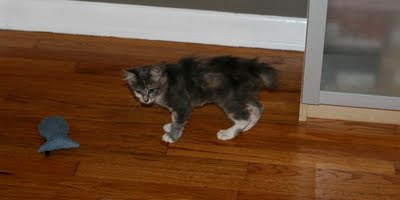 She currently resides in the Tarrytown Austin Pets Alive! cattery where I work. I love her so much. She wants nothing more than a good lap to lounge upon and a place where she can run around a bit. She could use some exercise. Some might call her fat, but I think of her as a sweet chunky monkey. I get a little misty-eyed each time I put Lady Gray back into her enclosure. She loves running around the store and napping on a lap as we work on the computer. Lady Gray also likes to curl up on the retail shelves, and nearly got to spend the night outside her enclosure one night. We were closing up, and forgot she was out, because she was so quietly contented. With all the cat & kitten adoptions discounted to $25 tomorrow at Austin Pets Alive, I'm SO tempted to bring home Lady Gray (a.k.a. cat #4/pet #5 for the 1952 House). She has a cute way of drinking water too. Between auditions, my work with Austin Pets Alive!, dinner theater and volunteering with Austin Pets Alive!, it's been a while since I had an entire day off from work. However, the schedule page looks clear next week for some me-time! Hooray! I'm going to use that free time to eat some food -- seriously, my skinny jeans are baggy. I'll go to the gym. Maybe even start reading a new book. Yeah... that's how I roll. 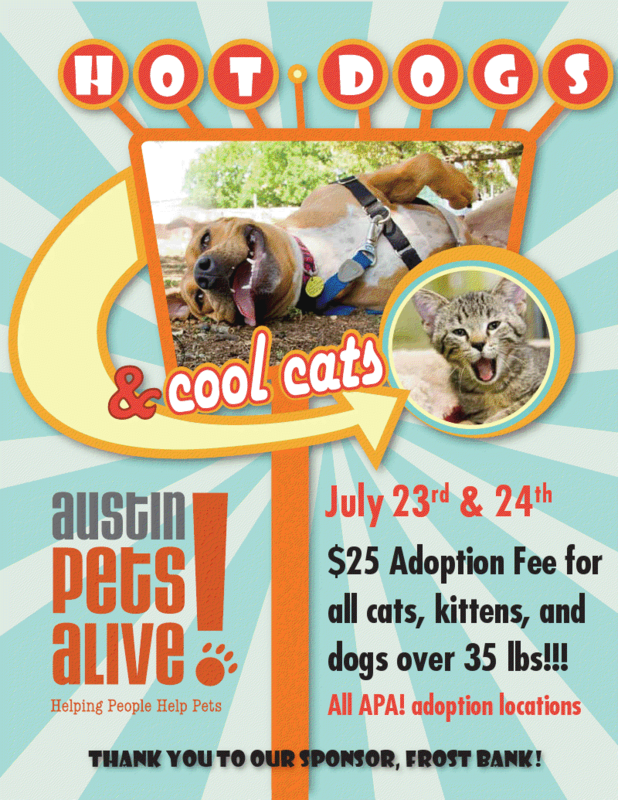 However, before that glorious time off, I get to see LOTS of adoptions happen this weekend at Austin Pets Alive! Tarrytown! Visit me noon - 5:00 this Saturday & Sunday at 3108 Windsor Road. 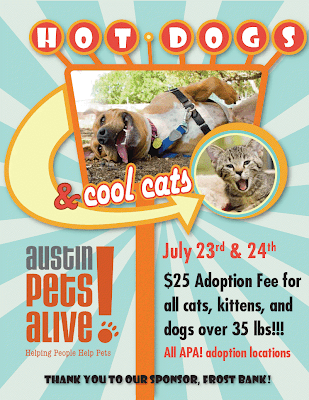 Special reduced rate of $25 adoptions for all cats and kittens plus all dogs over 35 pounds. Many thanks to our awesome sponsors at Frost Bank. My schedule has been nuttier than a fruitcake. I hate fruitcake. However, my schedule should start to look more like chocolate chip cookies without nuts soon. 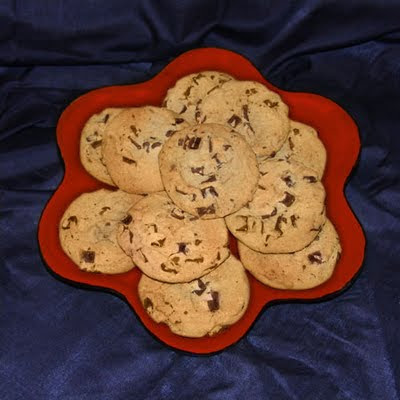 Mmm... chocolate chip cookies without nuts. My clothes are fitting more loosely lately, but I'm holding onto those bigger sized clothes for when I have some time to eat again.